Subscribe to our Free E-Magazine on Religion. 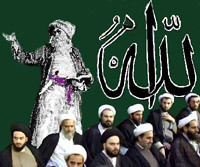 Muhammad was a great Prophet of Allah and he had come with the message of Allah to preach a new religion called Islam where Allah will be the only God and Muhammad his prophet. Born to `Abdu`llah ibn `Abdu`l-Muttalib, Muhammad initially adopted the occupation of a merchant. The Islamic sources indicate that he was a charismatic person known for his integrity. He in his youth was called with the nickname "Al-Amin", a common Arab name, meaning "faithful, trustworthy" and even was sought out as an impartial arbitrator. Muhammad often retreated to a cave on a mountain outside Mecca called Hira for contemplation. In the year 610, when Muhammad was about forty, he said he had been been visited in the cave by the Angel Gabriel who commanded him to recite verses sent by God. These revelations continued for the next twenty-three years, until his death. The collection of these verses is known as the Qur`an. He expanded his mission as a prophet, publicly preaching strict monotheism and warning of a Day of Judgment when all humans shall be held responsible for their deeds. He did not wholly reject Judaism and Christianity, two other monotheistic faiths known to the Arabs, but said that he had been sent by God in order to complete and perfect those teachings. Many in Mecca resented his preaching and persecuted him and his followers. Eventually, in 622, he was forced to move out of Mecca in a journey known to Muslims as the Hijra (the Migration). He settled in the area of Yathrib (now known as Medina) with his followers, where he was the leader of the first avowedly Muslim community. The Meccans started attacking Medina. Even though the attacking armies were several times stronger in numbers and in weaponry, Muslims defeated these invaders every time they attacked. Muslims finally took back Mecca under the leadership of Muhammad after eight years of exile and took control of the city. Not a single drop of blood was shed in the process of taking over Mecca by Muhammad. 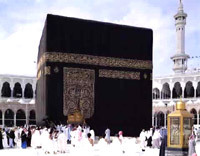 The Muslims subsequently removed all pre-Muslim religious objects, which they considered idols, from the Kaaba. Most of the townspeople accepted Islam. Deputations began to come in from other Arabian tribes. The conditions for their adherence were: the acceptance of Islam, the destruction of all idols and the payment of the `zakat` (tax) for the support of the poor community. In March 632, Muhammad led the pilgrimage known as the Hajj. On returning to Medina he fell ill and died after a few days, on June 8. Under the caliphs who assumed authority after his death, the Islamic empire expanded into Palestine, Syria, Mesopotamia, Persia, Egypt, North Africa, much of the Iberian Peninsula, and Anatolia. Later conquests, commercial contact between Muslims and non-Muslims, and missionary activity spread Islam over much of the Eastern Hemisphere, including China and Southeast Asia.